For Graphics Programming 2 students have to present 2 projects: a geometry shader and a game. Write a paper on a Geometry Shader (creation or destruction of geometry on the GPU) of choice and describe all aspects in a paper. Also implement the shader in the GP2 framework. GrapProg2-2015 LeoVansteenkiste GeometryShader-UnfoldShader from DAE on Vimeo. GrapProg2-2015 KoenVanDenSteen GeometryShader-Leaves from DAE on Vimeo. GrapProg2-2015 GuntranHoet GeometryShader-RebuildShader from DAE on Vimeo. GrapProg2-2015 AchilleDepla GeometryShader-VoxelTerrain from DAE on Vimeo. GrapProg2-2015 BartVerdonck GeometryShader-Fur from DAE on Vimeo. 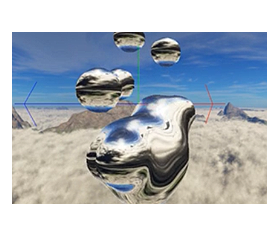 Create a 3D game that contains all subjects covered by the Graphics Programming 2 courses. To bring this assignment to a good end, you use the game engine from the GP2 classes. Students will work under guidance of the teacher on this framework for several classes. The concept of the game can be chosen by the student. GrapProg2-2015 GuntranHoet Project from DAE on Vimeo. GrapProg2-2015 MichelMohr Project from DAE on Vimeo. GrapProg2-2015 LeoVansteenkiste Project from DAE on Vimeo. GrapProg2-2015 ThomasVanRiel Project from DAE on Vimeo. GrapProg2-2015 AnPhuDupont Project from DAE on Vimeo.